The piece, titled, “Vitruvian Man,” featured Jesus Christ “nailed” to the board with four darts. 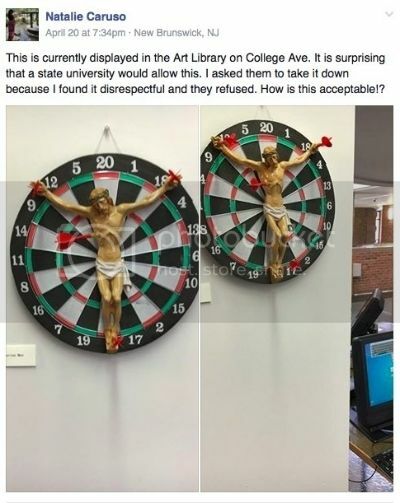 It was on display inside of the Art Library on Voorhees Mall before complaints from students and alumni led college leaders to take action, NJ.com reported. “The artwork in question was removed from the exhibit because it did not meet Rutgers University Libraries policy, which requires art exhibitions and their pieces to be based on university events, curricular offerings and topics of interest to the university community,” Jessica Pellien, director of communications at Rutgers University Libraries, told the outlet. She said that there is a process through which libraries determine how to choose artwork for display, but that the “policy and process the libraries use to select artwork for exhibitions was not followed” in this case. At first, the Jesus-themed piece was removed from a prominent spot near the circulation desk and moved to a lower shelf of a more concealed display case. But it was later taken out all together, according to NJ.com. The university has not named the individual who produced the piece of art, and it is unclear whether it was a student or faculty member, but one thing is absolutely clear: the debate over the now-removed piece has extended well beyond the Rutgers campus. I've missed the news where radical Christians at Rutgers have rioted, blown up the library, and randomly killed. And I've also missed the boy emperor's inevitable lecture - where he chimes in on current events with his brilliant perspective of "diversity" and "tolerance" and how everyone should respect the beliefs of others. Some things just leave you speechless.